During a time when most knew Visual Novels as either anime graphic novels you could play on your computer, or didn’t know them at all, the original Ace Attorney slid onto the Nintendo DS. Instead of magical vampires or harem romances, you followed Wright’s trials and tribulations as an up-and-coming defense attorney in a world of colorful characters and gruesome murders. Fifteen years later, the series is no less groundbreaking. Phoenix Wright: Ace Attorney – Spirit of Justice is the sixth mainline entry and tenth overall, yet the concepts and settings it captures are some of the best the series has offered yet. The main arc takes place in Khura’in, a foreign land rich in culture and tradition surrounding the Khura’inese religion. The monastic, devout citizens are a mix of Hindu, Buddhist and Tao principles. At the top is a theocratic monarch, her cigarchomping minister of justice and the young priestess who will one day rule. All three command the people with an iron fist, and the country rarely sees a real legal conflict thanks to the Defense Culpability Act a law passed by the queen’s regime that condemns any attorney to the same fate as their client. It takes little time for the writers to plunge you into the cultural conflicts that drive the story. Bubbling beneath the peaceful, serene surface is a revolution, ready to boil over at any moment – and logically, you end up in the thick of it all. It’s a broader narrative than any previous Phoenix Wright has tackled, but the game rarely suffers for it. Most of the grandeur serves to build a sense of purpose to the proceedings; you’re not just finding a murderer, but shaping the destiny of a nation. Spirit of Justice is still a Phoenix Wright story though, centered on the eponymous Ace Attorney and his two protégés, Apollo Justice and Athena Cykes. 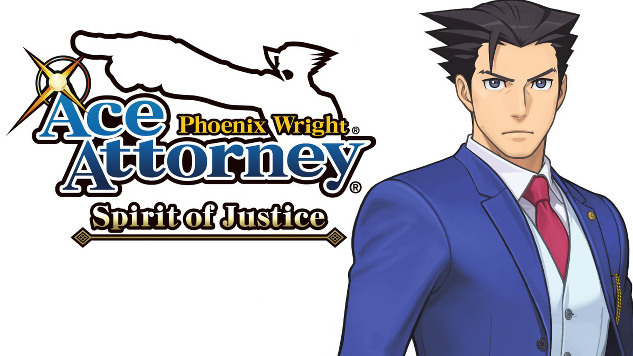 If Dual Destinies was Athena’s time to shine, Spirit of Justice is the Apollo Justice show – most of the major story beats that connect the cases together focus on Apollo’s growth as a lawyer, becoming an attorney that could someday rival Phoenix. Many other characters make cameos as well, though they mostly take a backseat to the new cast. Prosecutor Nahyuta Sadhmadi and the young priestess Rayfa Padma Khura’in are the supporting stars, and play excellent foils to the hopeful, energetic members of the Wright Anything Agency. Throughout the five long cases, both go through significant development as characters, becoming one of the most endearing side casts yet. Nahyuta starts as a caricature of a monk who has reached nirvana, but there’s always a small bit of sorrow in his speech; he goes through an incredible arc in the last case, as you learn why he’s so devoted to a regime that persecutes the law. Rayfa is similarly devout, raised by parents who have instilled a contemptuous world view, but by the game’s conclusion she has lost a great deal of innocence and grown stronger because of it. These characters, as well as some of the comedy relief side-characters like clumsy paratrooper Datz Are’bal and tour guide Ahlbi Ur’gaid, establish a secondary cast by the game’s end, one that’s a fresh departure from the familiar faces of Phoenix Wright. Hopefully they get better treatment in later games than some of the series regulars in who cameo in Spirit of Justice – Miles Edgeworth makes an appearance for appearance’s sake, and edgy emo prosecutor Simon Blackquill gets relegated to comedic relief in the game’s least compelling case. The five episodes of Phoenix Wright tend to follow the standard formula, even down to the length of each individual trial in some cases. Though fairly stock in structure, it doesn’t detract from the compelling nature of Spirit of Justice. Some of these cases, the climactic fifth episode in particular, are some of the best the series has ever had. In one, you might be dealing with a magic show gone wrong, and have to suss out how little changes in details could result in magical murder. In another, I hit a roadblock with one of the visual segments I was supposed to interpret, until I realized I was making a false assumption about the position of the body, and about the murder weapon. A common catchphrase of the series is to “turn your thinking upside-down,” and it shows best when the cases force you to stop making assumptions and start thinking outside the box. Most of the investigation and trial elements make a return in Spirit of Justice, to varying results. You still bounce between investigating crime scenes and interrogating witnesses for evidence, then defending your client in court. Some elements are utilized well, like Athena’s therapy sessions; others, like spotting nervous twitches and tells from witnesses when they’re lying, are still finicky at best. The greatest addition comes in seances, an aspect unique to the three Khura’in trials. Rayfa is able to commune with souls, allowing the court to see the last moments of the victim’s life. Usually used as damning evidence, you have to fight back by finding inconsistencies in the priestess’ insights. Perhaps what she interprets as a gunshot is actually an explosion, and if you have evidence to prove when an explosion might have happened, then you might be able to discern the true time and place of the crime. It’s not a perfect mechanic, and later visions caused a mild amount of frustration in the level of detail and subjectivity involved in sussing out conflicting ideas. The beauty of Spirit of Justice is in its willingness to experiment. The overarching container is familiar, but the inner workings are new and interesting. A main theme of Spirit of Justice is the old guard handing the reins for the future down to the younger generation; between Rayfa, Apollo, Athena and Nahyuta, there’s significant groundwork laid for the newer cast of core characters to drive the Phoenix Wright’s to come. Some of the new designs land, and some fumble, but the new ventures rarely detracted from the enjoyment I got from the newest Phoenix Wright. 2014’s Dual Destinies gave me hope that the series’ new direction would keep an aging visual novel saga alive. Spirit of Justice is a solid footstep on that path, and it feels as fresh and invigorating as the original Ace Attorney was for me, flaws and all.